Aaah! You're excited to install iOS8 on your iPhone1, but when you try to install from the Settings app on your iPhone, you see the message: "This update cannot be installed because it requires at least X GB of storage." Free up some space on your iPhone so you can install over-the-air from your Settings app, like you've been trying to do. That's what this article is all about! 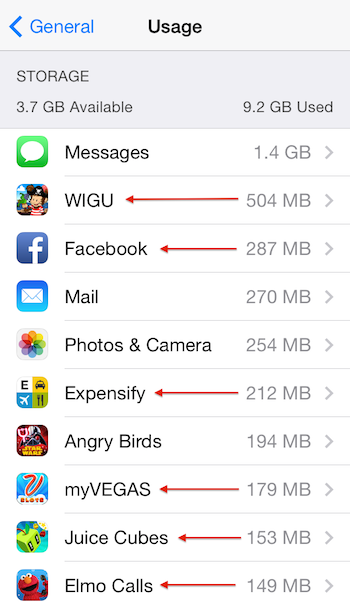 Delete trivial apps that use a lot of storage space. In your Settings app, go to General → Usage to see the apps using the most amount of space for document storage. Pick some of the top contenders (that don't have important data) and delete them. You can install them again from the app store after the update. Remember: games that integrate with Facebook or Game Center store your progress online, so it's safe to delete those too. A quick look at my storage usage shows me that six of my top-ten disk-space-using apps could be deleted and reinstalled later with no loss of information. Online services (like Facebook and Expensify) store all of their important data on their respective servers. Game in-app purchases can be restored after reinstalling. Copy your camera roll to your computer so you can delete all of your photos. As a bonus, you'll be sure you have your photos in case there is a problem during the upgrade. Mac: On a Mac, you can use iPhoto to import your camera-roll photos. Another option is to use the Image Capture application to quickly copy the photos to a folder of your choice — helpful if you're not a fan of iPhoto. Image Capture and iPhone will both help you bulk delete images from the iPhone after importing, which will save some time. Windows: On Windows, you may get a prompt to import pictures when you plug in the device via USB. Otherwise, the Apple Support page linked here has directions for importing photos for each Windows version. If you sync with iTunes, temporarily reduce the amount of videos, photos, and music you're syncing. You can sync them back via iTunes later. If you have the option "Automatically fill free space with songs" checked in iTunes for your iPhone, you definitely want to uncheck that to help free up space!